We Offer Custom Fence And Gate Services Too! When you own a large portion of land, such as a farm or ranch, it can seem a little overwhelming to fence it in, particularly with the varying state laws regarding fencing, livestock containment, and everything else. It can become even more difficult to plan out when deciding which livestock will be kept where, and installing the appropriate fencing for each species. As experienced farm fence builders, the team at Ware Fencing is happy to help with all of your fencing needs. We are the go-to farm fence installers in Crowley and Fort Worth, TX and the surrounding areas, and with good reason! We use only the highest quality of materials, and when it comes to craftsmanship, we pay attention to every last detail. If you’re interested in learning more about our fencing services, give us a call today at 817-948-4503! When discussing large properties with farm fence installers, many new landowners just want to rope off the entire plot in barbed wire and call it a day. In truth, that’s perfectly fine, if that land won’t be used for anything, and you merely need something to mark your property line. However, if you plan to use that land, you may need to consider viable farm fence and ranch fence options. While in many ways, the fencing styles are similar, there are some key differences. If you plan to use your farm for crops primarily, you will want dedicated farm fencing that keeps people and animals out, rather than the type of fence that keeps livestock in. Those options vary but split rail fences reinforced with mesh wire are particularly popular for keeping hungry animals out of your fields. For cattle and horse ranches, you’ll need several different kinds of ranch fencing if you want to properly contain and protect all of your livestock. Our pipe and cable fences are particularly popular for protecting and containing horses, while our electric fences are a favorite for cattle. Cattle Fencing Cattle fencing is a necessity for any property owner that wants to keep cattle safe from harm! Horse Fencing Horse fencing can be tricky, but at Ware Fencing, we have several safe options you can choose from. Barbed Wire Fencing Barbed Wire Fencing is not only affordable, but also effective at marking miles of property lines. Split Rail Fencing This fencing type offers a traditional style, as well as a durable and reliable function. Electric Fences If you are looking to keep your livestock even safer, consider our affordable electric fence options. If you need a farm fence that will last for decades, Ware Fencing can help with a variety of techniques. 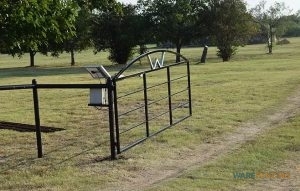 Call us at 817-948-4503 today to learn more about the options we have available for farm and ranch fences. With plenty of years of experience in farm fence repairs and replacements, we know properly put your fence together. Our farm fence installers in Fort Worth, TX are dedicated to customer service too, and waiting by the phone for your call. Call our experts now to begin! Updated on September 20, 2018 at 8:59 am by Ware Fencing.